French patisserie, rolled sponges and mousse cakes are on the menu for this week’s challenge – if you fancy giving the Bake Off contestants a run for their money, read on to see what the UK’s best chefs would rustle up. Having survived Botanical and Batter Week, the remaining Great British Bake Off contestants will be glad to get back to normal with the challenges of Dessert Week. One of the loosest categories, it covers a wide range of baking favourites and provides the contestants with an opportunity to show off lots of different skills. This year, however, the intrepid bakers will be tackling perfectly rolled roulades, batches of identical mini mousse cakes and a technical challenge that can even trouble the most accomplished Parisian patissier. 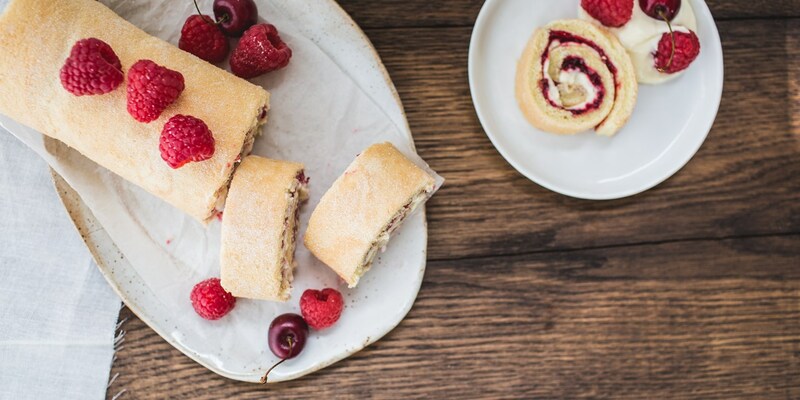 A roulade involves rolling a thin layer of sponge cake around a cream filling, so it’s vital to ensure it isn’t too dry to avoid splits and cracks. Chef Steven Doherty’s Chocolate roulade couldn’t be more classic, with the sponge wrapped around a raspberry cream with sliced strawberries and drizzled with a sharp raspberry sauce. Russell Brown’s White chocolate and lemon roulade, however, is a thing of true beauty, combining homemade lemon curd with a white chocolate mousse enveloped in a rich duck egg sponge. This week’s technical challenge comes from the holy city of pâtisserie, Paris, and requires the bakers to create a dacquoise, a cake made with layers of hazelnut- and almond-flavoured meringue and praline covered in buttercream. Cutting meringue into even, crack-free layers is a near impossible task, but Paul and Mary are bound to be unforgiving this far into the competition. Mousse cakes are a masterclass in how contrasting textures can come together to create something truly magnificent, but for the Dessert Week showstopper the bakers will have to create a batch of miniature-sized marvels that look and taste identical. Chef Josh Eggleton certainly seems to be a fan – just take a look at his recipes for Chocolate and peanut mousse cake and Hazelnut, caramel and sesame mousse cake to see why. William Drabble’s Chocolate mousse cake with raspberries looks so inviting and decadent the contestants would be wise to follow his lead, but we’re expecting some more intriguing flavour combinations from a few of them, even though poor Rav went home last week.